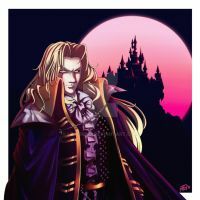 I love your depiction of Simon's Castlevania II look! Np your art is amazing, you really should consider selling it but I understand if you don't. You love to give freely to the community which is awesome. Usually some people get money through PayPal or they go to conventions to sell their art. This is awesome! The attention to detail in the VK whip and shadowing in the armor really sell this. Good job! I know I said I'd draw one some day, I've just been having a really heavy Zelda fling lately, and haven't felt much inspired by Castlevania at all... I will get around to drawing him one day though! aaahgg this looks so so pretty! of course dear i really liked this! looks really good already! aww i love leaving some nice comments too! hope you have fun drawing Simon!